When not in the studio, I’m in the classroom, as an artist-in-the-schools. For the past 5 years, I’ve been contracted by schools in Wake and Johnston Counties. With a background in biology and anthropology, and a tendency (possessed by many artists and scientists) to find connections between things, I’ve developed several programs that integrate different subjects (the technical term is “content areas”), like science and social studies with art, and, for that matter, math, reading, etc. 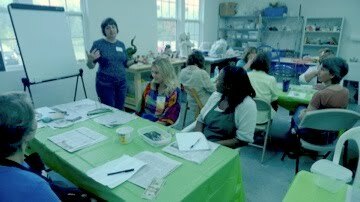 It’s been a great opportunity to share my passion of working with clay. And to learn from very fearless creative people who are shorter than me–6 year olds! Just kidding. So far, I’ve worked with people ages 4 to 97 and have learned so much from everyone I’ve met. Like being fearless and just enjoying the process, with little concern about the outcome (ages 4-6), what happens if you get too worried about the end result (a few kids here and there, ages 8-10), never to have preconceptions (all ages), the wisdom of enjoying the process with little concern about the outcome (yes, I know I just said that, but this lesson was from a 97 year old–amazing how it takes 90+ years to relearn that lesson, huh?). On Saturday, 18 elementary school art teachers from Wake County, NC (Raleigh and Cary areas) came to the studio for a half-day workshop on clay projects. 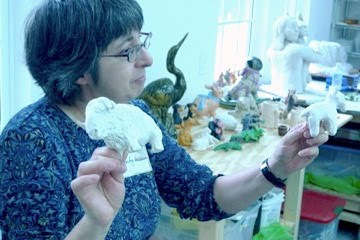 The theme was animals and I set out several models I’d made for various grade levels. We had a great time. Talk about dedicated! My husband was a teacher for many years and we know teachers spend countless hours outside of the classroom preparing lesson plans, grading papers, etc. Art teachers need tons of energy–they have to set up for different projects many times a day and there is the potential for a lot of mess making that has to be cleaned up between classes (which are a few minutes apart) and at the end of the day. 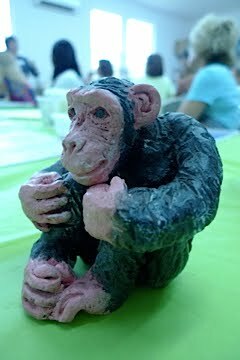 I can make a pretty good mess with clay, but can you imagine paint, glitter and glue??? These teachers traveled an hour or more, so really gave up most of their Saturday. How one idea can work for different grade levels. 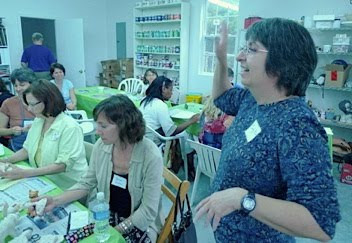 The teachers made several models they can use for projects with their own classes. What a thrill to be in the presence of so many talented people! A creative use of tools. 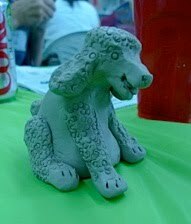 This poodle was made by one of the participants. I used to be terrified to speak in public but it’s not hard when you’re passionate about your subject. Even the clay models had a good time. 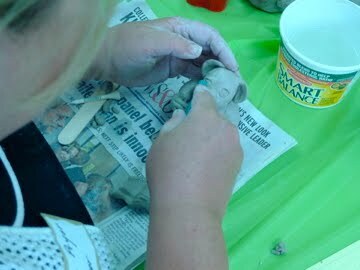 Afterward, I heard remarks like, “I can’t wait to get back to the classroom to share my new knowledge.” One teacher said she now has a project for her fifth grade, studying Pre-Columbian art. WhaddaYOUlookinat? 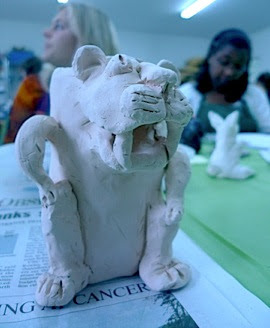 A jaguar pot for students studying pre-Columbian art. Many thanks to Slater Mapp for taking and sharing the photos!! !